Click here to visit their facebook and like them. Then on the “Topper’s Tantrum” tab, click prepare complaint. Make a funny complaint and you’ll be able to request a free box on the next page. Allow 4-6 weeks for delivery. Hurry, because I don’t think this will last long at all. Image Credit: Triscuits; thanks Dawn! Love the whole grains! Diet friendly! I love triscuits for breakfast, so good. Oh I wish I had a big box of Triscuit to snack on. Oh I wish I had a big box of Triscuits to snack on right now. I would love some triscuits. Yea! Love triscuits, especially free ones! Thanks Nabisco….I’ll try not to eat the whole box at one sitting,lol! Love My Triscuits w/ Tunafish!! YUm! I need a free box. I haven’t had any in a year. once I start to eat them Icant stop. Ifind out I dont have any more. How do you join? and receive free stuff. This is my favorite cracker!! love Triscuits with a little shredded cheese on top – microwaved for about 10-15 seconds! i love them they are my fav!! COMPLAINT! There are never enough Triscuits in the box!! I tried and tried the Tantrum Topper’s comment area, but got nowhere fast. I love Triscuits with sausage and Gouda cheese on them. Great late night snack! I cant live without a triscuit cracker! triscuits are so good my favorite is the garlic and cracked pepper. Pretty please I love these!! Gimme, gimme, I need! I need! I love all kinds os Triscuits!!!!! Triscuits are good with any topping or just by themselves! My favorite cracker. We always have some in the house. Filling out the form for the free box was fun too. they are great, you might want to try them!!! love these little crackers.like the oil & blach pepper best..
Would love to try !! I got one today. Ty! Btw, your post on FB disappeared. 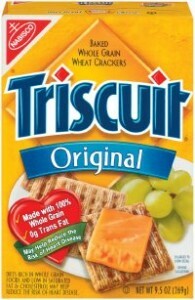 I have been enjoying Triscuits since i was very young my mom bought them. .Thank you for the free box of Triscuit. I passed my love of triscuit to my kids.